At Anthem Memory Care communities, we constantly seek opportunities to bring school children through our doors to meet and get to know our residents. 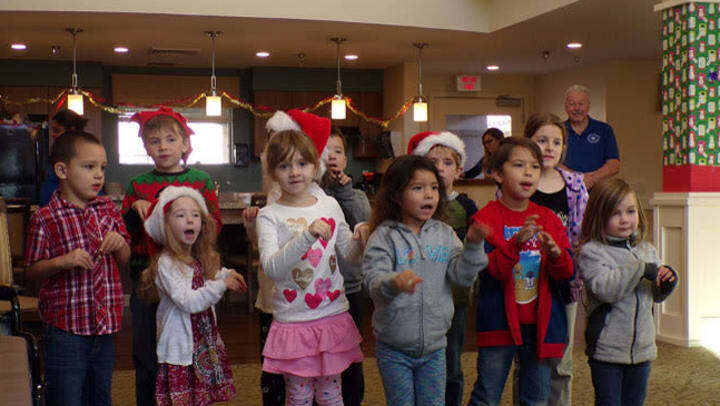 Recently, Vineyard Place Memory Care in Murrieta, California invited a group of local pre-schoolers to join their residents in creating and decorating holiday crafts. And, while the holidays are officially over, the program lives on. Why? Because bringing those with dementia together with others, especially young people, provides an opportunity to engage and socialize, something that has proven to have a positive effect, not only on the residents, but on the staff and the visitors. For those with loved ones struggling with dementia, those special moments you share together can have a lasting impact – for both of you! Therefore, it is important to make sure your loved one is surrounding by people who are dedicated to creating an environment that enriches the moments of their daily lives. Because, while the details of those moments may be forgotten, the feeling of joy lives on.